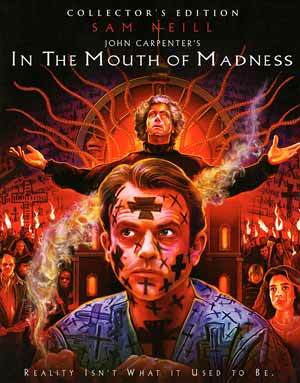 In the Mouth of Madness is the best Stephen King adaptation that wasn’t with a trippy premise and great performance from Sam Neill under the direction of John Carpenter. Shout Factory provided me with a free copy of the Blu-ray I reviewed in this Blog Post. Plot Synopsis: Sutter Cane (JURGEN PROCHNOW) is the best-selling author whose newest novel is literally driving readers insane. When he inexplicably vanishes, his publisher (CHARLTON HESTON) sends special investigator John Trent (SAM NEILL), along with assistant Linda Styles (JULIE CARMEN), to track him down. Drawn to a town that exists only in Cane’s books, Trent and Styles cross the barrier between fact and fiction and enters a terrifying world from which there is no escape. Quick Hit Review: In the Mouth of Madness is one fun and trippy thriller, one which you’d think was based off of a Steven King novel. 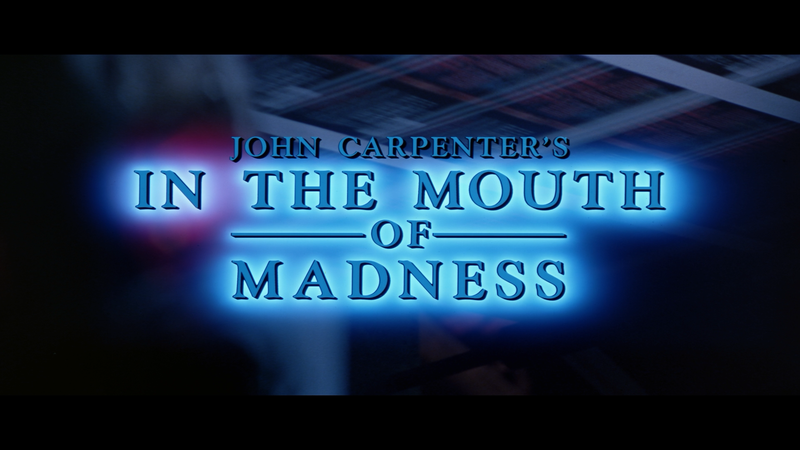 Although this isn’t John Carpenter’s best, it is on the unique side in terms of storytelling and the performance from Sam Neill, who previously worked with Carpenter two years prior with Memoirs of an Invisible Man, and he was tremendous going down the path of, well, madness. Meanwhile, the supporting cast all were good: Jurgen Prochnow as the elusive author was unsettling in his few scenes; Julie Carmen in the female lead played well off of Neill; and Charlton Heston was as gruff as ever. This release comes with a matted slip cover and an interior cover with reversible artwork. Both of these offer different perspectives, the first newly recorded so you get Carpenter’s perspective 20+ years later while the second is on the more technical side. Horror’s Hallowed Grounds (11:30; HD) is one of my favorite shows and glad to see a new crop up here as host/creator Sean Clark takes viewers to the original filming locations and provides background on each. The Whisperer of the Dark (9:46; HD) is a new interview with actress Julie Carmen discussing how she got the role and working with Carpenter and co-star Sam Neill. Greg Nicotero’s Things in the Basement (16:34; HD) – Here the Special Make-Up Effects Artist recollects his work on the project. Home Movies from Hobb’s End (12:07; HD) are some archival behind-the-scenes footage. The Making of In the Mouth of Madness (5:02; SD) is a vintage featurette from 1995 as a way to promote the film. Also included is the Theatrical Trailer (1:46; HD) and some TV Spots (9:34; HD). 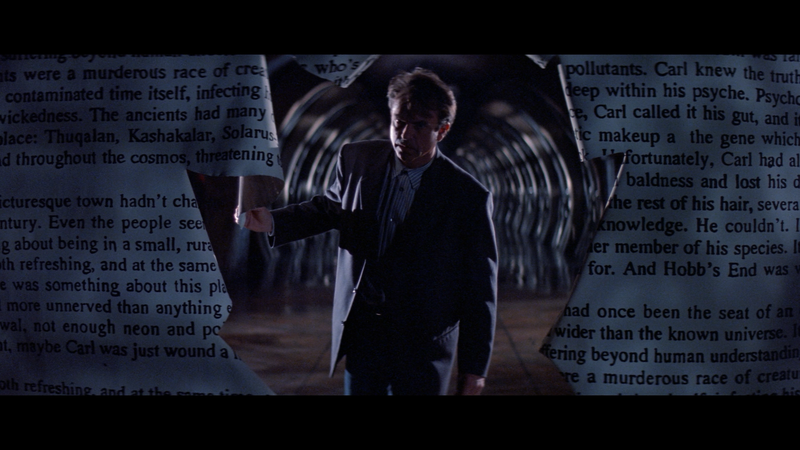 In the Mouth of Madness comes to Blu-ray receiving a new 4K scan from the original film elements where the original 2.35 widescreen aspect ratio and has a 1080p high-definition transfer. The picture does look quite good with some sharp and well defined detail, a good color array and some deep black levels. There were a few specs that I noticed and some natural film grain and noise, but all in all was clean looking. The disc comes with an adequate and relatively strong DTS-HD Master Audio 5.1 track. Dialogue levels came through with fine clarity via the center channel while the front and rear channels were more or less relegated for ambient noises, off-screen action or the music from John Carpenter and Jim Lang. Overall, In the Mouth of Madness is the best Stephen King adaptation that wasn’t with a trippy premise and great performance from Sam Neill under the direction of John Carpenter. The “Collector’s Edition” Blu-ray has good video and audio transfers and a solid selection of bonus features to check out.